On occasion I feel compelled to knock a movie because it tries too hard to span genres. I don’t do so because I believe that films should stay firmly locked into their various varieties. Indeed, when done well, a flick that can’t be clearly placed into one field or another can be exceedingly pleasing and worthwhile. In my opinion, 1986’s House fell into that category. It offered a fairly early example of a comedic horror flick, but it succeeded neither as a scarefest nor as a laughathon. In the end, the movie seemed like a somewhat confused and dated piece that didn’t do much for me. There’s nothing wrong with a comic horror film per se, and the haunted house concept featured in House was certainly ripe for some gags. However, I thought that House included too much material that wasn’t right for the lighthearted treatment. The movie used some themes and topics that could have been quite intense if the filmmakers had gone down a more harrowing path. Frankly, I think that’s what they should have done. With the correct approach, House could have been a decidedly disturbing ride, and the subject matter really makes more sense within that style. At the start of House, successful novelist Roger Cobb (William Katt) returns to the house he lived in as a child. His aunt had helped raise him, but she just committed suicide, and Roger inherited the place. Troubled by the mysterious disappearance of his son - which occurred in his aunt’s house - and still coming to grips with his divorce from TV star Sandy (Kay Lenz), Roger decides to move into the house; apparently he figures that perhaps renewed residence will help him figure out what happened to his boy. He also hopes that he’ll be able to write again. Although he scored quite a few hits with scary novels, Roger suffers from writer’s block, and he can’t get his autobiographical tale of his experiences in Vietnam off the ground. Add those issues to his list of material to contribute to his potential breakdown; he remains distraught over the fate of one of his war buddies. Suicide, divorce, missing kid, dead friend, man on the verge of a nervous collapse - is it just me or does this sound like odd material for a light touch? Nonetheless, that’s the method behind House. After Roger moves in to the place, he discovers some strange supernatural episodes, and he starts to believe these may be connected to his son’s disappearance. Ultimately his Vietnam experiences tie in to the affair as well as the plot becomes even more complicated. Would House have been more satisfying if it had taken a more nightmarish approach? Perhaps not, for a lot of factors would have affected it; with the same crew behind it, I doubt it would have worked in that format. Director Steve Miner has yet to demonstrate much talent via duds like Halloween H2O and Lake Placid; he absolutely defines the notion of the journeyman filmmaker who plods along from one inconsequential flick to another. Katt seems to be badly miscast as Roger. He brings no substance to the role’s psychological demands, and he lacks any comic flair that might make the lighter scenes work. Even George Wendt as neighbor Harold fails to bring any life to the proceedings. Harold resembles Norm from Cheers, so one would think Wendt would do well in the part. Perhaps the character was too familiar, for Wendt sleepwalks through the film; he brings no spark or fun to the flick. Frankly, I was surprised that I found so little to like during House. I saw it when it first appeared back in 1986, and from what I recall, I thought it was a fairly entertaining flick. However, 15 years after that, I clearly feel differently. House tries to be a fun and lightly scary romp, but it takes on subjects that don’t fit that style. Inside this story, there was a disturbing and horrific tale waiting to get out, but unfortunately House buries those elements with fluff. House appears in an aspect ratio of approximately 1.85:1 on this single-sided, single-layered DVD; the image has been enhanced for 16X9 televisions. Despite the film’s age and low-budget origins, this disc offered a surprisingly fine picture that displayed only a few concerns. Sharpness generally seemed to be nicely crisp and detailed. During a few wider shots, I discerned a small amount of softness, but these instances were rare. As a whole, the image looked distinct and well-defined. A few modest moiré effects appeared, but I saw no signs of jagged edges. Print flaws were also rather minor. Some grain showed up in a few low-light situations, and a few instances of speckles and grit also cropped up from time to time, but as a whole, this was a nicely clean and fresh picture. House featured a fairly subdued palette, but the film’s colors consistently seemed to be clear and accurate. The hues looked acceptably vivid and distinct, and they showed no signs of bleeding, noise or other issues. Black levels seemed to be pretty dense and dark, and shadow detail was clean and natural. Low-light situations may have displayed some grain, but otherwise they looked very good, as they appeared appropriately heavy but not excessively thick. Ultimately, House provided a much more positive visual experience than I expected. The film’s monaural soundtrack also worked reasonably well for the material. Speech occasionally betrayed some edginess, but for the most part, dialogue sounded fairly natural and crisp, with no problems related to intelligibility. Effects were a bit thin at times, and they didn’t pack much of a punch, but they came across as acceptably realistic and accurate, and they lacked any significant distortion. Music showed a little depth as it presented modest bass response at times, but it also seemed to be somewhat thin and flat. Ultimately, however, I felt that the mix displayed reasonable range for its era, so I found this to be a decent little mix. Although I’ll never really gripe because a DVD didn’t include a 5.1 remix, I must admit I was disappointed that House didn’t receive this treatment. 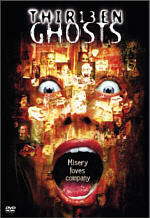 A creepy haunted house movie like this really would have benefited from the spooky ambience five channels can add. 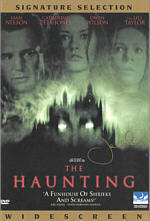 After all, literally the only reason The Haunting worked at all was because of its sublime sound design. House offered many opportunities for similar elements, so it’s too bad the film didn’t get the reworking. House packs in a few supplements, and we start with an audio commentary from director Steve Miner, producer Sean S. Cunningham, writer Ethan Wiley and actor William Katt. All four men were recorded together for this running, screen-specific track. Usually that kind of mass meeting leads to a lively piece, but that wasn’t the case with this fairly mediocre offering. It appears that none of the participants has seen House in quite some time, and their lack of familiarity shows. Quite a few empty spots occur, which is unusual for a commentary with so many participants; normally the folks involved have to jockey for position, but this one ends up with a fair amount of dead air. When someone does speak, the remarks are often fairly interesting; they mention some good notes about low-budget filmmaking, and there are some fun stories from the set as well. However, a lot of the track follows the participants as they get reacquainted with the movie, and it frequently seems as though they don’t remember it very well. Oddly, they make some factual errors even though they should hear the correct information as they watch the flick; for example, they consistently refer to the aunt character as Roger’s grandmother. Ultimately, this was a sporadically interesting but generally flat and slow-paced commentary. Next we find a 12-minute and five-second featurette called The Making of House. Created during the same era as the film, this clearly promotional piece offers lots of film clips plus some interview snippets and shots from the set. Due to its emphasis on advertising, it’s a very fluffy and silly program, but it does manage to provide a few decent images of the film’s effects work. As such, it may merit a screening for devotees of those kinds of creations. We also get a Still Gallery that includes 49 frames of material. These images show lobby cards, production shots, posters and other advertising pieces. Interestingly, one shot from House 2: The Second Story snuck its way into these pictures. Lastly, we find two theatrical trailers. Essentially the second is just a shorter version of the first. 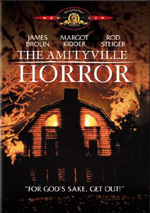 These were interesting to see if just because they rather strongly emphasized the film’s terror elements; there’s virtually no indication that House would be any different from flicks like The Amityville Horror. Of course, House was a somewhat different kind of scary movie, though I didn’t think it was a successful one. The subject matter featured in the film seemed to be inappropriate for the light and campy treatment, and the picture’s participants couldn’t help bring the material to a higher level. The DVD offers surprisingly strong picture and sound, and it also tosses in a few decent extras. Ultimately, I didn’t like House much as a movie, but this was a nice DVD that should please the film’s fans. Note: House originally came out on DVD in June 2001. 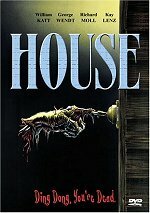 At that time, it appeared solely as part of the limited edition package along with its sequel, 1987’s House 2: The Second Story. The DVD found here exactly duplicates that one found there, so you don’t lose anything through the purchase of the solo disc.